Posts discussing product development practices, techniques, tools. Covers from the first innovative idea through to production of a physical product or delivery of a service. In a previous post, I talked about the voice of the customer (VoC), voice of the process (VoP) and the necessity of combining the two when specifying a product. Here, I’d like to offer a general method for applying this in the real world, which can be implemented as a template in Excel. I showed that there was a cost function associated with any specification that derived from both the VoC (expressed as tolerances or specification limits) and from the process capability. An example cost function for a two-sided tolerance is reproduced below. Percent of target production costs given an average production weight and four different process capabilities. 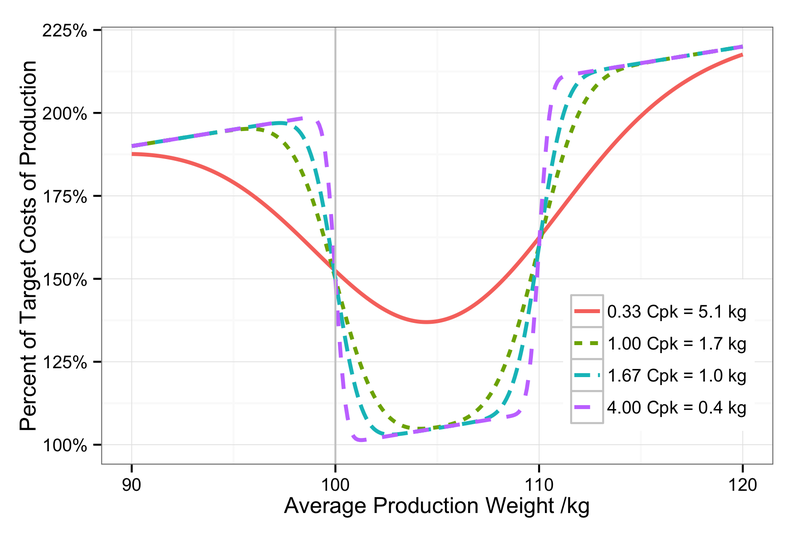 I argued that, given this cost function, specifying a product requires specifying both the product specification limits (or tolerances) and the minimally acceptable process capability, Cpk. Ideally, both of these should flow down from a customer needs analysis to the finished product, and from the finished product to the components, and so on to materials. To flow all requirements down like this, we would need to know the transfer functions, , for each requirement Y and each subcomponent characteristic X. There are methods for doing this, like Design for X or QFD, but they can be difficult to implement. In the real world, we don’t always know these transfer functions, and determining them can require non-trivial research projects that are best left to academia. As an illustration, we will use the design of a battery (somewhat simplified), where we have to meet a minimum requirement that is the sum of component parts. The illustration below shows the component parts of a battery, or cell. It includes a container (or “cell wall”), positive and negative electrodes (or positive and negative “plates”), electrolyte and terminals that provide electrical connection to the outside world. Usually, we prefer lighter batteries to heavier ones, but for this example, we’ll suppose that a customer requires a minimum weight. This requirement naturally places limits on the weight of all components. In the absence of transfer functions, we often make our best guess, build a few prototypes, and then adjust the design. This may take several iterations. A better approach is to estimate the weight specification limits and minimum Cpk by calculation before any cells are actually built. General drawing of the structure of aircraft battery’s vented type NiCd cell. Ransu. Wikipedia, [http://en.wikipedia.org/wiki/ File:Aircraft_battery_cell.gif]. Accessed 2014-04-04. Suppose the customer specifies a cell minimum weight of 100 kg. From similar designs, we know the components that contribute to the cell mass and have an idea of the percentage of total weight that each component contributes. Each individual component is therefore a fraction fm of the total cell mass, e.g. More generally, for a measurable characteristic c, component i has an expected mean or target value of or . The maximum allowed value of the characteristic. Also referred to as the upper tolerance. The minimum allowed value of the characteristic. Also referred to as the lower tolerance. Since the customer will always want to pay as little as possible, a specified lower weight of 100 kg is equivalent to saying that they are only willing to pay for 100 kg of material; any extra material is added cost that reduces our profit margin. If we tried to charge them for 150 kg of material, they would go buy from our competitors. The lower specification limit, or lower tolerance, of the cell weight is then 100 kg. If the customer does not specify a maximum weight, or upper specification limit, then we determine the upper limit by the maximum extra material cost that we are willing to bear. In this example, we decide that we are willing to absorb up to 5% additional cost per part. Assuming that material and construction contributes 50% to the total cell cost, the USL is then 110 kg. To allow for some variation, we can set a target weight in the middle: 105 kg. From data on previous designs and the design goals, we can apportion the target weight to each component of the design, as shown in the table below. We can apply the same fractions to the cell USL and LSL to obtain a USL and LSL of each component. As long as parts are built within these limits, the cell will be within specification. The resulting specification for cell and major subcomponents is illustrated in table [tblSpecification]. Further refinement of the allocation of USL and LSL to the components is possible and may be needed if the limits do not make sense from a production or cost perspective. 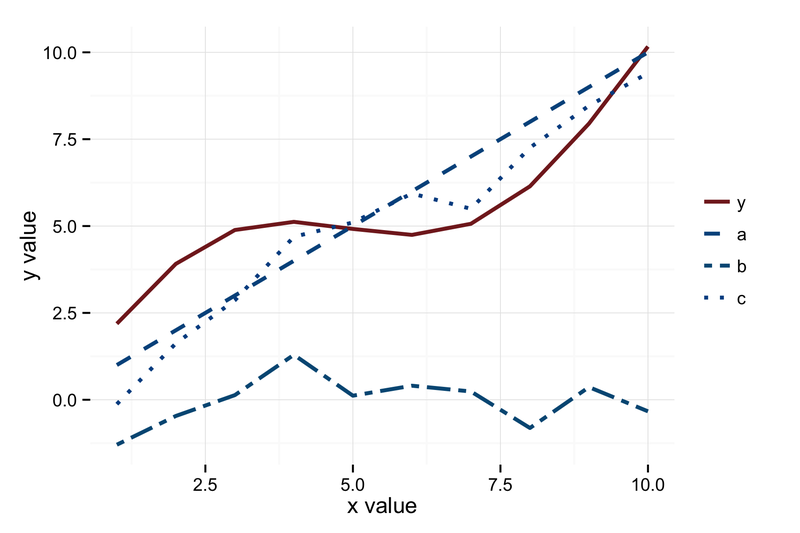 Since the given is the maximum allowed for the parent to meet the desired Cpk, this means that is an estimate for the maximum allowed component variance. Manufacturing can produce parts better than this specification, but any greater variance will drive the parent part out of specification. Make them as wide as possible to allow for manufacturing variation while still meeting the VoC. Make them as narrow as possible to stay near the minimum of the cost function. For this, Crystall Ball or iGrafx are very useful tools during development, as we can simulate a set of arts or processes, analyze the allowed variation in the product and easily flow that variation down to each component. In the absence of these tools, Minitab or Excel can be used to derive slightly less robust solutions. Identify any customer requirements and set specification limits (USL and LSL) accordingly. If the customer requirements are one-sided, determine the maximum additional cost we are willing to accept, and set the other specification limit accordingly. Some approximation of costs may be needed. If no target is given, set the target specification for each requirement as the average of USL and LSL. Set the minimum acceptable Cpk for each specification. Cpk = 1.67 is a good starting value. Use customer requirements for Cpk, where appropriate, and consider, also, whether the application requires a higher Cpk (weakest link in the chain…. Calculate the maximum allowed standard deviation to meet the Cpk requirement as . For each subcomponent (e.g. the cell has subcomponents of container, electrodes, electrolyte, and so on), apportion the target specification to each of the subcomponents based on engineering considerations and judgement. If the fractions are known, . Calculate the fraction (or percent) of the parent total for each subcomponent if not already established in step (5). Calculate the USL and LSL for each subcomponent by multiplying the parent USL and LSL by the component’s fraction of parent (from step 6). and . Calculate the minimum allowed Cpk for each subcomponent from the results of (5), (7) and (8), using the target, , for the mean, . Repeat steps (5) through (9) until all components have been specified. For each component, report the specified USL, LSL, target T and maximum Cpk. When there is no clear customer-driven requirement or clear requirement from parent parts (e.g. dimensional specifications that can be driven by the fit of parts), but specification limits are still reasonably needed, we can start from existing process data. This is undesirable because any change to the process can force a change to the product specification, without any clear understanding of the impact on customer needs or requirements; the VoC is lost. The calculation of USL and LSL from process data is also somewhat more complicated, as we have to use the population mean and standard deviation to determine where to set the USL and LSL, without really knowing what that mean and standard deviation are. where is the number of process Sigmas desired, based on the tolerance cost function. Most of the time, we will use , to achieve a Cpk of 1.67. We always use the upper 95% confidence interval on the standard deviation. We don’t care about the lower confidence interval, since a small will not help us in setting specification limits. Calculate the mean ( ) from recent production data. In Excel, use the AVERAGE() function on the data range. Calculate the standard deviation ( ) from recent production data. In Excel, you can use the STDEV() function on the data range. If the order of production data is known, or SPC is in use, a better method is to use the range-based estimate from the control charts. This will be discussed in subsequent training on control charts. Count the number of data points, n, that were used for the calculations (1) and (2). You can use the COUNT() function on the data range. In Excel 2010 and later, TINV() should be replaced with T.INV.2T(). Calculate the 95% confidence interval on the mean as and . In Excel 2010 and later, CHIINV() can be replaced with CHISQ.INV.RT() for improved accuracy. Calculate the LSL as . You might use a value other than 5 if the customer requirements or application require a higher process Sigma. Calculate the USL as . For each subcomponent (e.g. the cell has subcomponents of positive electrode, negative electrode, electrolyte, and so on), apportion the parent part mean to each of the subcomponents based on engineering considerations and judgement. If the fractions are known, . If the the fraction (or percent) of the parent total for each subcomponent is not known, calculate it using the results of step (9). Calculate the minimum allowed Cpk for each subcomponent from the results of (5), (7) and (8), using the target for the mean, . Repeat steps (9) through (13) until all components have been specified. Every product development project includes uncertainty over what will happen. The uncertainty—each assumption or best guess—reduces our chances of project success. The job of the project manager and team members is to ensure success by managing risk. When something goes wrong—deviates from the plan—it stops being a risk and becomes an issue that must be addressed to ensure success. Issues are those conditions that are having a negative impact on your ability to execute the project plan. You can easily identify them because they directly cause schedule slippage and extra work. There are two simple tools that can—and should—be used on every project to manage risks and issues to prevent disaster. One is the risk register; the other is the issue log. In my experience, these two documents are often conflated, but they are distinct documents that should contain different information and drive different actions. The risk register is a means of capturing risks that we want to monitor over the life of the project so that we can take action before they have a negative impact on the project. These are conditions that you have decided not to explicitly work into the plan, but don’t want to let “slip under the radar” to create big issues for you later. The issue log is where you record any problems that were not accounted for in the plan and that threaten to delay the project, push it off budget or reduce the scope (e.g. reduce product performance). The issue log is fundamentally about corrective actions. The project has deviated from the plan, and now we need to get back on course to complete the project on time, on budget and with the agreed goals. The issue log is used to capture this information. While the cause of the problem is often obvious, it is always a good idea to probe for deeper, systemic causes that could lead to further delays. Asking “why?” five times in order to permanently and irrevocably fix a problem doesn’t take very long compared to the total delays that a project can experience. The hard part of a risk register is the risk profile. Different people respond differently to risk, and some are more comfortable with thinking about uncertain outcomes than others. These differences between people lead to a lot of variation and debate in identifying risks; a good strategy for making risk registers easy is to standardize. The best practices are to focus on the causes of the risk and the probable impacts and to standardize the process. There has been a lot written about risk management. Some of the best, in my opinion, is the work by De Meyer, Loch and Pich, which was first brought to my attention by Glenn Alleman over at the Herding Cats blog. In their excellent book, Managing the Unknown: A New Approach to Managing High Uncertainty and Risk in Projects , they break down risk into two major components: relationship complexity and task complexity. When the relationships of stakeholders or partners are complex—groups aren’t aligned—then you can expect disagreements and conflict. Successful strategies for dealing with relationship complexity include increased communication and more rigidly defined relationships. When tasks are complex—there are many links between tasks, so that changing one task can affect many, or there is a high degree of uncertainty in what needs to be done—then the successful strategies range from critical path management to an entrepreneurial approach of working multiple solutions in parallel (see also De Meyer 2001). By implementing these pairings of source of risk with management strategy in a risk register template, we can greatly simplify the process and drive more consistent risk management results. Adding in a simple analysis of the impact can help us with prioritization (where do we spend our resources monitoring) and monitoring frequency. Monitoring is all about how you will know when to do something about the risk. i.e. You want to decide in advance what condition will trigger you to transition this risk to the issue log. Measures should be relevant to the risk, quantitative where possible and the method of measurement should be clearly defined (you don’t want people disagreeing over the project plan just because they measure something differently). Set up measurement intervals that make sense by asking yourself how long you can go without knowing that you have a problem. Plot the results as a time series or on a control chart to allow you to distinguish between normal variation in the measurement and a condition that requires action. Loch, Christoph H, Arnoud De Meyer, and Michael T Pich. Managing the Unknown. Hoboken, New Jersey: John Wiley & Sons, 2006. Print. De Meyer, Arnoud, Christoph H Loch, and Michael T Pich. “Uncertainty and Project Management: Beyond the Critical Path Mentality.” 2001 : 1–23. Print. The R Function Reference is a mind map that I created as a guide for novice and intermediate users of the R statistics language. When you first open it, I suggest that you collapse all the nodes by clicking on the “Expand/Collapse all nodes” button in the bottom left of the screen to make the map easier to navigate. You can also adjust the zoom level with the slider next to that button. The mind map is arranged in eight sections, or main branches, arranged by task. What do you want to do? Each branch covers a general set tasks, such as learning to use R, running R, working with data, statistical analysis or plotting data. The end of each string of nodes is generally a function and example. The Reference provides code fragments, rather than details of the function or complete reproducible code blocks. Once you’ve followed the Reference and have an idea of how to accomplish something, you can look up the details in R’s help system (e.g. “?read.csv” to learn more about using the read.csv() function), or search Google or the online R-Help mailing list archives for answers using the function name. There are a lot of useful nodes and examples, especially in the “Graphs” section, but the mind map is not complete; some trails end before you get to a useful function reference. I am sorry for that, but it’s a work in progress, and will be slowly updated over time. In comments, several users reported problems opening the mind map. With a little investigation, it appears that the size of the mind map is the problem. To try to fix the problems , I have split the mind map out into several small mind maps, all linked together. The new main mind map is the R Function Reference, Main. The larger branches on this main map no longer expand to their own content, but contain a link to a “child” mind map. The link looks like a sheet of paper with an arrow pointing to the right, click on it and little cartoon speech bubble will pop up with a link that you have to click on to go to the child mind map. Likewise, the central nodes on the child mind maps contain a link back to the main mind map. Due to load times and the required extra clicks, this may slightly reduce usability for users who didn’t have a problem with the all-in-one version, but will hopefully make the mind map accessible to a broader audience. I have to offer praise to the developers of Mind42. Though I couldn’t directly split branches off into their own mind maps or duplicate the mind map, it was very easy to export the mind map as a native Mind42 file and then import it multiple times, editing the copies without any loss of data or links. The ability to link directly between mind maps within Mind42 was also a key enabling feature. Considering that this is a free web app, its capabilities are most impressive. They were also quick to respond when I posted a call for help on the Mind42 forum. Please let me know how the new, “improved” version works. The old mind map, containing everything, is still available, but I will not update it. The immediate and obvious answer was that it wouldn’t and couldn’t. Theoretically, a large decrease in this (X) might cause an increase of a few percent in that (Y); nothing more. Only someone was claiming that decreasing X decreased Y, too. They were right. No, the theoretical relationship isn’t wrong. It’s right. The theoretical calculation is fairly straightforward. You put so much of X in, and, after some calculation, you get so much of Y out. The less X you have, the more Y you get. The hard part is figuring out just how much of X you’re putting in. The measurement of Y introduces a bunch of variation based on other factors. You measure by changing certain conditions A, B and C. These, in turn, affect some other factors, M and N. X, A, M and N together determine what value you measure for Y. So decreasing X affects the other factors in such a way that the net effect is a decrease in the measured value of Y. Not really. The theoretical calculation should tell us what the best case is…what our target should be. The actual measurement is going to produce different results based on various factors, some of which we control and some we can’t. A calculation based on the measurement process would require uncertainty ranges and return a probability distribution; not a singular value. Messy. Engineers and researchers need to consider both of these as definitions. If you’re designing for some characteristic, as a researcher or engineer you’re usually going to be concerned with the theoretical calculations. This is how you were taught in school, and you’ll naturally be interested in getting as close to the best case as possible. However, not everyone is going to be interested in the theoretical calculation. The folks in Quality who are checking the product for conformance will be more interested in how it’s measured, the operational definition, than in the theoretical definition. The manufacturing plant only want to hear about the operational definition; for them, the world would be a better place without the theoretical definition. As a design engineer, you need to be more concerned about the operational definition. You’ll be arguing that you designed a part for Y performance (or to “do Y“). The next question that management and your customers should (and probably will) ask is, how do you know you designed it to do that? The answer is always by data analysis. How do you get the data? Via the operational definition. What you know is determined by how you measure, and that’s the operational definition. This has applicability well outside of engineering design. Physicists have been arguing this very point ever since Bohm and Heisenberg developed the Copenhagen interpretation of quantum physics. Management by objective depends on the ability to close the loop by measuring outcomes. This means that management by objectives requires operational definitions of every objective (though few organizations actually get this far, and management by objectives becomes management by manager gut feeling). Even more enlightened management techniques, such as those advocated by Deming and Scholtes, require operational definitions to enable an organization’s performance improvement (e.g. through the use of control charts, which are only possible with operational definitions). Use the theoretical definition to tell you the best possible case, but be sure to design according to the operational definition.